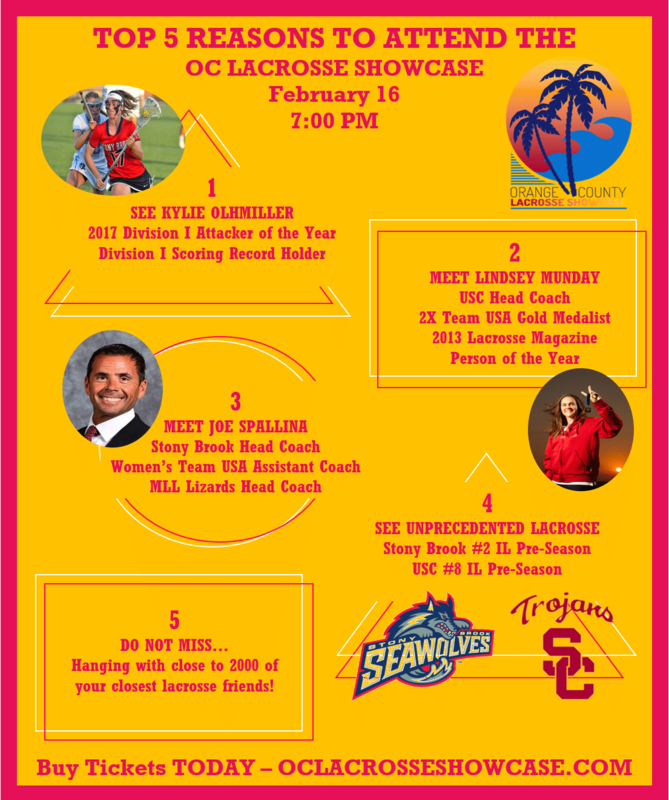 The University of Southern California Trojans women’s lacrosse team will play the Stony Brook University Seawolves in the inaugural Orange County Lacrosse Showcase on Friday, February 16 at Orange Coast College. The OCLS is the epitome of female collegiate competition in Orange County and in Southern California. This game will be the only opportunity to watch two Top 10 Division 1 Women’s Lacrosse teams play in Orange County this season. Stony Brook coach Joe Spallina embodies Long Island lacrosse, and after a successful run as the head coach of the Adelphi women’s program, he has taken over the Stony Brook women’s lacrosse team and turned it into an immediate winner. The engineer of the nation’s best turnaround in 2012 and winningest coach in program history after only three seasons, Spallina has the Seawolves competing annually for the America East title while also bursting onto the national women’s lacrosse scene. He completed his sixth season in 2017 with a stellar 101-20 overall mark, a 33-2 record in America East action and five consecutive America East titles and NCAA Tournament appearances. Under Spallina, Stony Brook has produced 12 IWLCA All-Americans, seven Tewaaraton nominees, one Tewaaraton finalist, five conference championships, five NCAA Tournament second-round berths and an NCAA quarterfinal appearance. Spallina led Stony Brook to new heights in 2017, as the Seawolves posted a program-best 20-2 record and advanced to the NCAA quarterfinals for the first time in program history. Stony Brook had the nation’s top scoring defense for the fourth time in the last five seasons under Spallina’s guidance, while the Seawolves also recorded the nation’s No. 3 scoring offense and a nation-leading 10.09 assists per game. Spallina coached four IWLCA All-Americans in 2017, including Tewaaraton finalist Kylie Ohlmiller, who broke the Division I single-season points (164) and assists (86) records, and Tewaaraton nominee Dorrien Van Dyke. The Seawolves won six games over ranked opponents in 2017 while reaching as high as No. 3 in the national polls. One of the most accomplished collegiate women’s lacrosse players in the history of the sport, Lindsey Munday was handpicked to lead the first-ever USC women’s lacrosse team and was officially hired on Monday, Jan. 3, 2011. She enters her fifth season (2017) as the head coach of the Women of Troy. Munday’s accolades both as a player and as a coach earned her recognition as Lacrosse Magazine’s 2013 Person of the Year. She is a two-time Mountain Pacific Sports Federation (MPSF) Coach of the Year (2015 and 2016) and was chosen as the Intercollegiate Women’s Lacrosse Coaches Association (IWLCA) West/Midwest Coach of the Year in 2016. Inside Lacrosse (ILWomen) honored Munday as its 2016 National Coach of the Year. In four complete seasons at USC, Munday holds a 51-26 (.662) overall record with a 28-7 (.800) mark in MPSF games. The Trojans have advanced to the league tournament in each of the last four seasons; appeared in their first title game in 2015, and won both the MPSF regular-season and tournament championships in 2016. Munday led the Women of Troy to their first-ever berth in the NCAA tournament in 2015 where USC defeated James Madison in the first round. 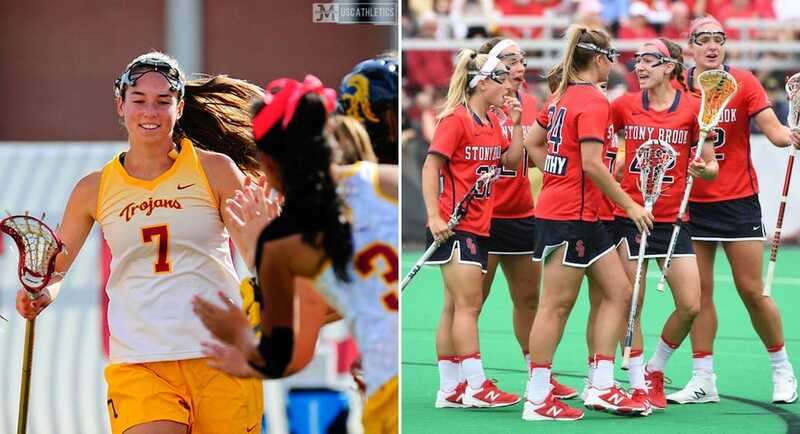 In 2016, USC became the first-ever team from the West Coast to host a NCAA tournament game. The Trojans received a first-round bye, defeated Stanford in the second round, and advanced further than any MPSF team had ever gone with a quarterfinal appearance against Syracuse.